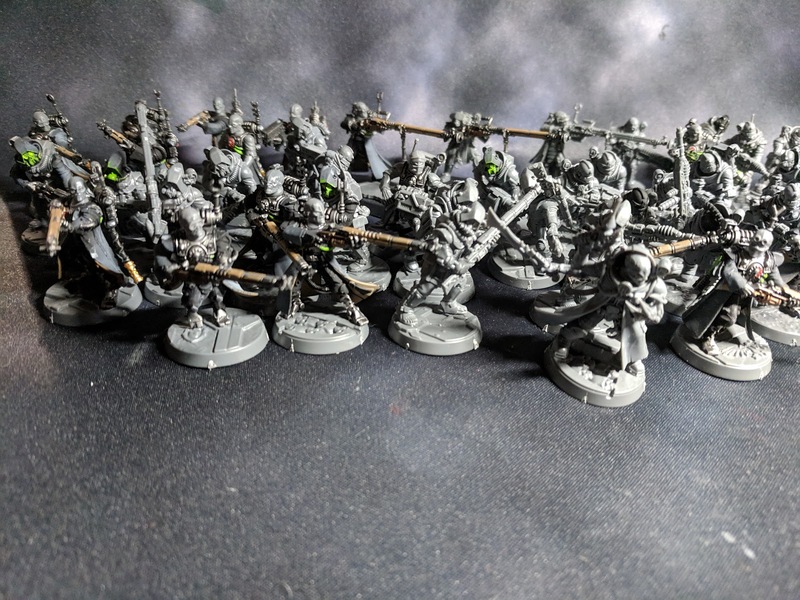 A couple weeks ago I shared my progress on kitbashing Skitarii and Neophyte kits for my Genestealer Cult Mechanicus project. 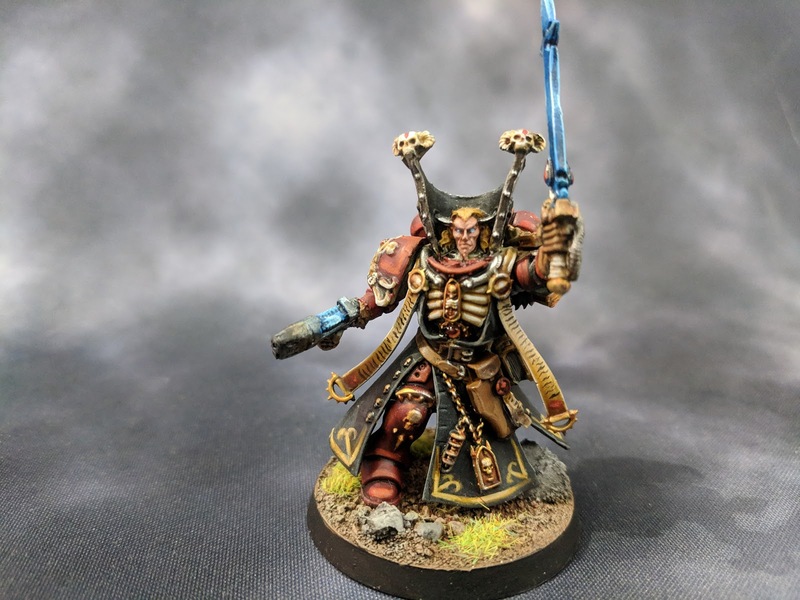 While my goal is to copy Bryan with weekly updates, I didn't post last week because it was basically the same as my first WIP Wednesday post - just assembling more Neophyte Skitarii. 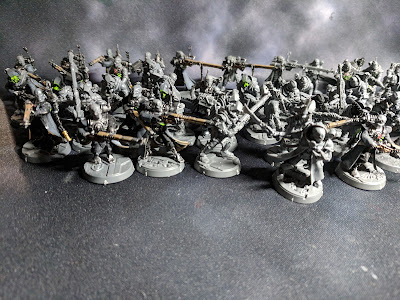 With 45 of the kitbashed Troops now done, I shipped them off to a painter, Petar, I have been working with for the last year or so to help me somewhat keep up with my backlog. Just as a quick plug for him, he has done some awesome work for me and really helped me get my Blood Angels army (Knights Crimson) off the ground, including converting up an awesome Mephiston. If you're interested in a commission, let me know and I can get you in contact. 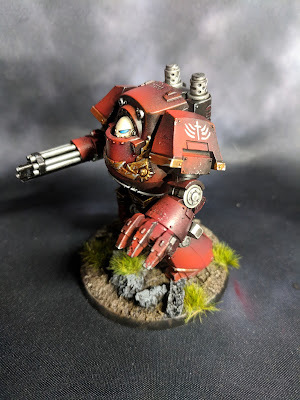 With the Skitarii Neophytes out of my hands, I turned to another project and managed to get some painting done last weekend on a Contemptor Dreadnought for my Knights Crimson. I had gotten the base coat and airbrush highlights of red done a little while ago. From there I blocked in the silver and gold metallic, followed by Nuln Oil and Agrax Earthshade washes respectively. After the washes, I went back and picked out highlights on both. The gold got a lighter gold highlight, followed by a steel ultimate highlight. Meanwhile, the silver just got a single highlight of the steel. Along with that, I snuck in some blue for the lenses and some highlights on the bone helmet. 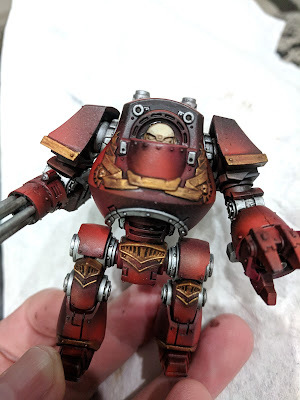 After touching up some spots and a few small spots of black, I added weathering using a sponging of black and silver to add chips to the red paint, concentrated on the feet and fist, with some other more minor chipping on the front armor. A couple other minor details and he was essentially finished. The only things left are some airbrush effects around the exhaust and heat scoring on the guns, as well as cleaning up the rim of the base. 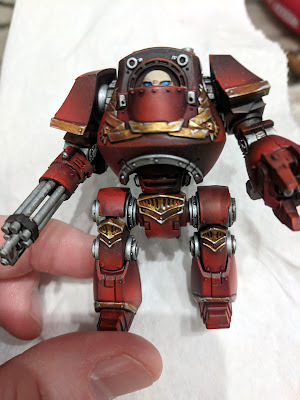 The airbrush bits will probably wait until his brother is done as well so I can knock out both at the same time. 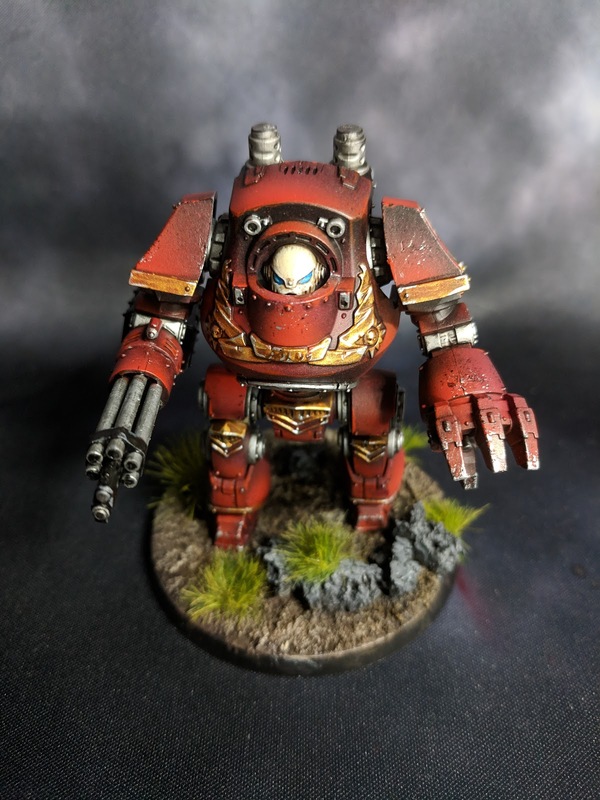 In addition to finishing off the Contemptor, I also added a little paint to some Rievers. 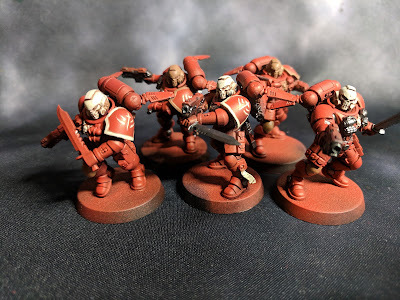 These guys, so far, have mostly been a target of opportunity when I get a couple minutes here or there, which is why three have the bone done and three do not; same for the base metallics. While I'm wandering a bit aimlessly, I do have an RTT next weekend which may shape what partially started project I try to finish in the next week. I do have one possible list that includes these Rievers, but I may move away from that and stick to things that are totally done, freeing up my hobby time to continue following muses. But that's all for this week. What projects do you have on your hobby desk?